EuroSavant » I Protest! Take My Blood! I Protest! Take My Blood! 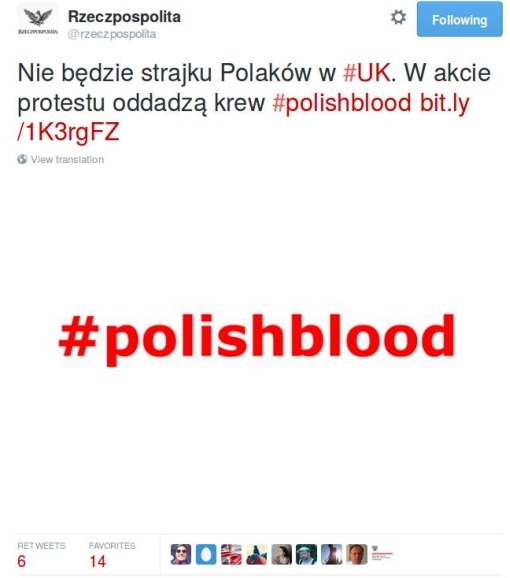 Perhaps some of you in the UK will have already heard of the remarkable #polishblood initiative, but most have not. And it is all supposed to go down tomorrow (that is, Thurs., 20 August). This is a tale of the birth and growth of a special meme, largely via social media, in this case among the very many people of Polish citizenship living and working in the UK. It started out of the substantial accumulation of grievances held by this particular cohort against the country they chose to move to – basically, of the many instances of unfair discrimination against Polish people as being foreigners, as an unwelcome people coming to the UK to steal native jobs, to compete for resources, take up space on a crowded island generally, etc. “20 thousand pounds reward for information on the affair of the degenerate who brutally attacked an immigrant” – Polish, of course. That must have been a satisfying feeling, getting that off one’s chest and being able to look forward to a coordinated, nation-wide action designed finally to demonstrate the error of their ways to what UK-based Poles perceive as an often resentful native population, insufficiently appreciative of their contributions to modern-day Britain. Just how things went on from there, however, is not so clear. For the evident down-side of such public action – assuming it really can successfully be coordinated on a wide scale in the first place – is that it could make British people angry even as it reminded them of how much they depend on the Poles. Indeed, it might make them angry precisely by making them aware how much they depend on the Poles. That is why we now have #polishblood, at least as Rzeczpospolita (which is of course one of the leading national newspapers in Poland) reports it. Don’t go on strike; instead, take some time from your work to go to the local hospital, or Red Cross center, and donate blood! That’ll show those Brits! Ha! No regular Anglo-Saxon person will be able to donate blood his/herself that day, as all the slots will be taken up by Poles! In fact, according to the Rzeczpospolita piece, this new campaign took off among Poles so much that even they were having trouble arranging to go give blood on the appointed day (which is 20 August: tomorrow), so that many of them had to resort to booking times to do so even several days before. But no, the “action” will involve giving blood. Naturally, there is a #polishblood Facebook page set up for coordination, where the very first line in the Polish message states flat-out “There’s no time to organize a strike.” That doesn’t keep one respondent, a little way down, from inquiring plaintively “Is someone not going to work tomorrow? ?” The fellow obviously was looking forward to a day off. Tomorrow [20 AUG] will show whether it comes to a strike, and if so – at what scale. The original idea included not just leaving off work, but also a peaceful demonstration at 12 noon in front of the British Parliament in London. Polish Express knows it cannot guarantee a strike on any sort of significant scale – but it can guarantee that demonstration, so presumably that at least will indeed come off.